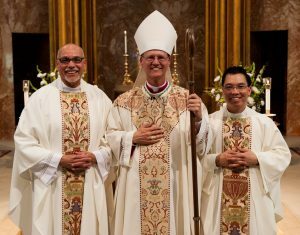 Yesterday, this local Church had a truly joyful celebration in bestowing the grace of Holy Orders upon two new priests; Rev. Augustine Carrillo and Rev. Hiep Nguyen. 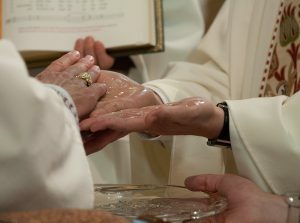 These ordination ceremonies are powerful, not only for the families and friends of those being ordained, but for the People of God whom they will serve, and especially for the priests of the local presbyterate of whom they become the newest members. There was a great turnout of family, friends, classmates, parishioners, and of course, brother priests. There is such a strong fraternity that exists among priests. It surely mirrors the bonds of friendship which Jesus himself forged with that first group of apostles. Priests are such a gift from God. It reminds me of the words of Jesus himself when he said about his apostles: “Father, they are your gift to me.” (John 17: 24) The same can be said by every bishop of everyone of his priests: “Father, they are your gift to me.” And surely, the People of God feel the very same, and such gratitude was on full display in the Cathedral at yesterday’s ordination Mass! It seems providential that this year’s ordinations were practically on the Vigil of Pentecost. The Holy Spirit is alive in the Church, and as in every age, still giving the gifts necessary to meet the challenges and needs of the Church and society today. The gifts of the Holy Spirit are given to all, not just the clergy. And all hands are needed on deck to cooperate fully with the Holy Spirit for the renewal of the Church. These newly ordained were given strong instruction in yesterday’s Gospel to continue to call forth the gifts of all of God’s people for ministry and service for the building up of the Body of Christ, the Church. Lord Jesus, as you gave us your life you said: “Do this in memory of me.” May all your disciples fulfill your command of love. Raise up in our diocese humble men to the priesthood, faithful people to the consecrated life, and holy men and women to married life. May all your disciples hear your call to holiness and have the courage to respond with generous hearts. Amen! Congratulations, Rev. Augustine Carrillo and Rev. Hiep Nguyen! May God bless your, your ministry, and all those whom you will serve in the years ahead!